Our bag is a lovely large heavyweight tote made from 10oz unbleached canvas. It has gusseted sides so it’s spacious and short handles to make carrying that bit easier. It is perfect for all manner of jobs from carrying books and magazines to filling to the brim at the farmers’ market. 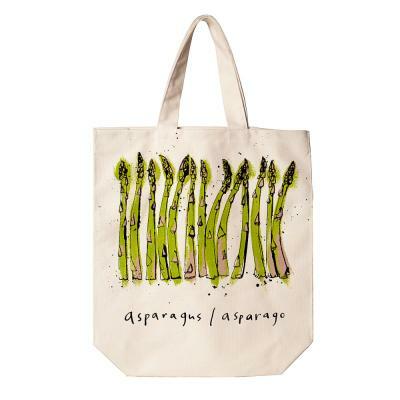 Asparagus is so welcome when it shows up, oh so briefly, each May. But now you can enjoy its beauty all year round lined up like soldiers (you must try it like soldiers by the way, dipped in a runny boiled egg) on both sides of this lovely bag. Delicious.